Forest Hill came about in late 2011 as a way for me to work on and improve my then fledgeling artistic ability. Thus, throughout the comic’s run, you get to see my journey as I not only work on improving my art, but also my story telling, and thus my craft. 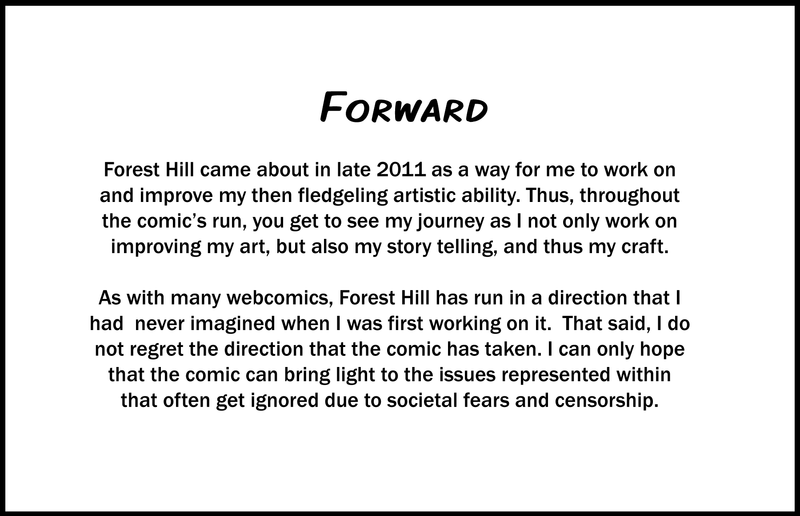 As with many webcomics, Forest Hill has run in a direction that I had never imagined when I was first working on it. That said, I do not regret the direction that the comic has taken. I can only hope that the comic can bring light to the issues represented within that often get ignored due to societal fears and censorship.